(PhysOrg.com) -- Recent extreme weather events as far as Australia and Africa are being fueled by a climate phenomenon known as La Nina -- or "the girl" in Spanish. La Nina has also played a minor role in the recent cold weather in the Northeast U.S. The term La Niña refers to a period of cooler-than-average sea-surface temperatures in the Equatorial Pacific Ocean that occurs as part of natural climate variability. This situation is roughly the opposite of what happens during El Niño (the boy) events, when surface waters in this region are warmer than normal. Because the Pacific is the largest ocean on the planet, any significant changes in average conditions there can have consequences for temperature, rainfall and vegetation in distant places. Scientists at the International Research Institute for Climate and Society (IRI), part of Columbias Earth Institute, expect moderate-to-strong La Niña conditions to continue in the tropical Pacific, potentially causing additional shifts in rainfall patterns across many parts of the world in months to come. These shifts, combined with socioeconomic conditions and other factors, are making some countries more vulnerable. However, La Niña and El Niño conditions actually allow for more accurate seasonal forecasts and help better predict extreme drought or rainfall in some areas. Thats because they affect global atmospheric circulation patterns in known ways, and scientists can use this knowledge to help societies prepare better, issue early warnings and reduce any negative impacts associated with them. "Based on current observations and on predictions from models, we see at least a 90 percent chance that La Niña conditions will continue through March," said IRI's chief forecaster, Tony Barnston. Climate scientists have found La Niña's fingerprints on a number of extreme weather events such as the devastating flood that occurred in Pakistan in 2010, as well as flooding in West Africa, South Africa and most recently in Queensland, Australia, where an area equal to the combined size of France and Germany was underwater. La Niña is also to blame for Cyclone Yasi, one of the strongest to hit Australia, which came ashore on Feb. 2. 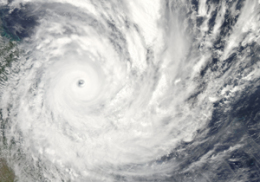 Cyclone Yasi is the second most damaging Australian cyclone on record after Cyclone Tracy, which struck in 1974. But La Niña isn't to blame for the recent severe weather affecting the Northeast. Winter weather for these regions is often driven not by La Niña but by large-scale weather patterns over the U.S., the northern Atlantic Ocean and the Arctic. These are often short-term, and are generally predictable only a week or so in advance. They are the culprits responsible for the dip in temperatures and spike in snow storms in the Midwest and Northeast. In addition to extreme rainfall, La Niña can lead to drought conditions. Currently in East Africa, it has caused drier-than-usual weather, sparking food-security concerns in areas lacking irrigation, including parts of Somalia, Kenya, Ethiopia and Tanzania. Parts of South America, Asia and the southern U.S. may also see lower rainfall for the first quarter of 2011. Since 1950, the world has experienced six major La Niña events, wreaking havoc in countries around the world. In 2000, for example, floods associated with La Niña affected 400,000 people in southern Africa, caused at least 96 deaths and left 32,000 homeless. La Niña conditions typically persist for 9 to 12 months, peaking sometime during the end of the year. But 2010 was a lively year for climate scientists: For the first four months of this year, El Niño conditions prevailed in the tropical Pacific, but that quickly changed, and by June, a La Niña pattern had emerged. "Last year's transition from El Niño to La Niña was about the most sudden we've ever had," Barnston said. "When we had rapid flips like this in the past, we sometimes ended up having a two-year La Niña, such as right after the El Niño episodes of 1972 to 1973 and 1997 to 1998." Barnston cautions that the likelihood of this happening with the current La Niña is unknown. "Even if we do have a second year of La Niña developing in northern summer 2011, we expect at least a brief return to neutral conditions from May to July of 2011." Why? Why la nina? Why el nino? What is the difference in severity between the current condition and past la nina? More? Less? Unmeasurable? What is the cause of the dramatic increase in temperature within the Arctic circle? I've heard that, for Australia and India at least, the less publicised and less studied Indian Ocean Dipole has a stronger influence on climate than the Pacific does. In the negative phase (which it is in at the moment), the dipole tends to pull moisture away from India and towards Australia. Admittedly this is unlikely to be associated with Yasi, but it may be responsible for the increased rainfall and flooding in southern Australia. The south west of Australia has experienced near record drought last winter and so far this summer we are cooking with bush fires everywhere. All of these oscillating currents are interrelated. As are the movements of the airmasses riding over them, and the polar currents and airmass movements above the polar regions. A change in one affects, to a greater or lesser degree, all the others. It's called fluid thermodynamics, or thermal hydrodynamics. Take your pick. That's part of it. Don't forget chemistry and the electromagnetic interactions between our planet and the sun. Biology also plays an important part. I think that the growing field of chaotic nonlinear dynamics is also going to be important to our understanding of how all the different pieces of our atmosphere interact. Who's to say that Yasi would not have happened if a particular butterfly half way around the world hadn't beaten it's wings a year before? Thermodynamics alone does not fully explain the workings of our atmosphere. Take for example, an algae bloom. A large algae bloom will change the color of the sea over a significant area. That changes the albedo of the water. That changes the regional weather, which could then promote an early spring bloom somewhere else, which changes the land albeo and air chemistry in that area, which changes cloud patterns. It's not just thermodynamics. Looks like a post of mine was deleted because it didn't agree with the existing dogma. Nobody bother with those things called "facts". Kinda like the idiot that didn't realize the leading hurricane experts say GW will cause more Shear. AGW alarmists just can't handle the fact that you can't blame hurricanes on GW. I posted in another thread, where all I did was suggest three good official sources to read about the current research on the links or lack of links between storm activity and climate change. I suggested U of Miami, NOAA and MIT. I got multiple 1/5 from the AGW people. If they don't trust NOAA, then I don't know what to say. I would have linked IPCC or NASA, but their sites are really out of date. The science has changed a LOT since the last time those sites were updated. According to what I've read, you're only partially right about shear. It seems that some regions have seen increased shear and others are having decreased shear. A global trend (if there is one) isn't detectable yet, according to the top officials' latest published research. There's links to papers about it at NOAA. QC, that's half the equation. More shear causes fewer weak storms. This results in more energy being trapped locally or regionally resulting in larger storms that are more shear resistant. Gswift7's data supports this as ACE activity has remained stagnant overall for energy movement, but the volume of storms has decreased on the smaller end and increased in terms of larger storms. Actually, the data is inconclusive from what I have read. The prevailing winds from region to region have changed in different ways from year to year, leading to increases and decreases in strong storms that are inconsistent. Some areas with increased winds have seen more strong storms and others have less, while the same is true for areas with decreased winds. There are too many exceptions to make a strong conclusion. That's according to NOAA and every other major source, and that's based on 2010 research, not those old 2006 papers that claimed strong correlation. The newest data didn't continue along those same patterns, which is leaving them scratching their heads a bit. I linked to current sources in my other post. Note: when you look at studies, make sure you pay attention to whether they are talking about global or regional changes. Most of the NOAA studies are only looking at Atlantic storms, which are significant to the US, but globally represent only a drop in the bucket so to speak. Google the following and click the first link. It's from NOAA's Geophysical Fluid Dynamics Lab. You have to click the link in the middle of the page and select "run" to view the entire Nature article. Also note that there's a lot of confusing differences in terms. Weather related events is a broad term, not limited to hurricaines, and the measurements are further muddied by a mix of absolute magnitude versus dollar impact measurements. You really have to read carefully when you read this stuff. Here's the graphed data from the NHC for the Atlantic basin based on total number of named storms. I couldn't find your prior link but I'm fairly sure this is the data you were proffering. No, I was referencing a full peer reviewed study published in Nature. As you can see from both of my sources, the data prior to about 30 years ago is highly questionable. Really only the last few bars of the graph you linked to are reliable. That seems to be the 2010 concensus on tropical storms and climate change from every major expert source I can find. Global warming would increase the occurrence of El Nino, wouldn't it? SO this would decrease the cyclonic activity in Northern Australia. That's just a guess, does anyone have any thoughts on this? Global warming would increase the occurrence of El Nino, wouldn't it? Maybe, maybe not. They aren't sure about that yet. Global warming 'could' end the instability that causes the ENSO cycle altogether. If you look at the past 50 years, there has been a decreasing trend in the strength of the ENSO cycle. That could be coincidence. GCM's do not model the ENSO cycle very well, if at all. Even a six month forcast is difficult. For example, they think the current La Nina will end in late Spring or early Summer, but they don't know for sure. They also aren't sure if it will be followed by another La Nina or a 'neutral' period. That's according to the latest NOAA models. That's the best they can do, and it's not really very good. ENSO and the other major ocean cycles like the NAO and PDO are an area where a lot more work is needed. They are currently one of the biggest hurdles for climate models and predictions.